Summer happens every year and we all want to don a pair of bikini while sipping a cold refreshing drink by the beach. Even without summer, most of us do swimming for exercise for bonding with family in friends. The sad news is, most of us are conscious about our underarm and groin area because of its color and so end up being the wall flower on shorts and t-shirts. Dark armpits and groins is actually a very common concern despite the fact that we always see men and women on television wearing skimpy bikinis. A larger majority of the population are actually experiencing this condition due to several factors which can actually be easily addressed if discussed openly with a doctor. WHAT CAUSES DARK ARMPITS AND GROIN? There are medical causes that can be pointed out as the cause of dark armpits and groin, one of which, the most popular of which is diabetes as high levels of insulin can cause an over production of skin cells that can in turn cause pigmentation. Obesity is also one of the leading causes of darkening of the armpit and groin region. Personal hygiene such as the lack of which, the use of anti-perspirants which may irritate the skin (underarm), shaving, and clothing preference can also cause darkening of the skin on the underarm and groin area. The use of hormonal pills for women and pregnancy may also cause some discoloration on the area. WHAT ARE THE SOLUTIONS FOR DARK ARMPIT AND GROIN? Home remedies such as lemon, vitamin E, and other natural skin whitening treatments sometimes work, especially for the more superficial darkening such as those caused by skin irritation. If the darkening is caused by a certain medical condition, the only solution will be to treat the underlying disease first. Should the skin still not improve, then that is the time to consult a trusted dermatologist. If the cause is shaving, it may be best to switch to laser hair removal which is gentler for the skin. For darkening caused by hormonal pills, the pills should just be discontinued (but you should ask your doctor first if you they are prescribed). Should the cause be pregnancy, it usually goes back to normal once your hormones have stabilized after pregnancy. However, if what you thought was the cause has been stopped or been treated but there is still no change in terms of the lightening, then it may be best to try another mode of treatment which is laser. 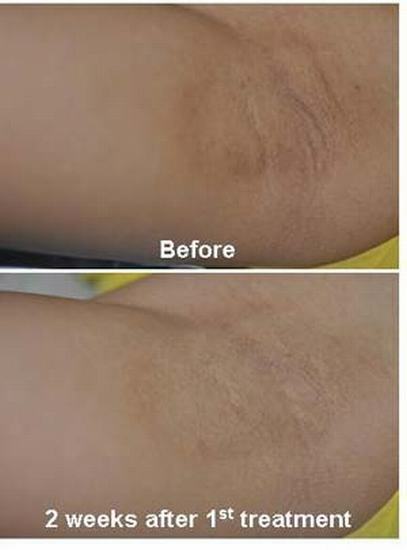 Laser treatments to lighten the otherwise dark groin and underarm are available at Yoskarn Clinic. These lasers will target the pigmentation leaving the skin lighter. The treatment may however take 3 or more session before desired result is achieved. Usually, a support of pigmentation cream is recommended after laser treatment to improve the result. This is however discussed during the consultation. The topic of dark armpits and groin is not something we openly discuss with our friends, much like our acne or wrinkles. For confidentiality and privacy purposes, we make sure we give you the most convenient ways. With this, we affiliated with Aphrodite Inn, the hotel just beside our clinic. For patients undergoing any treatment with us, staying at Aphrodite Inn allows them to enjoy their privacy as they don’t need to go outside anymore; patients are offered to use the adjoining door connecting Aphrodite Inn to our center for treatment and follow up purposes. Room service is also available anytime. Summer happens every year and we all want to don a pair of bikini while sipping a cold refreshing drink by the beach.